CHICAGO — Harry Potter fans, eagerly awaiting the release of the seventh and final book by J.K. Rowling, “Harry Potter and the Deathly Hallows,” got a chance to make a 20-second video about their love for all things Potter at three Chicago public libraries. 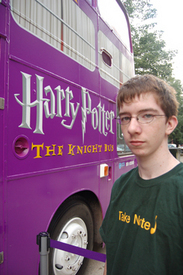 The Knight Bus, a purple, triple-decker bus featured in the Potter series, is making a U.S. library tour. Sponsored by the U.S. publisher of the Harry Potter books, Scholastic, the Knight Bus is stopping at public libraries from coast to coast. Librarians are welcoming the Knight Bus tour. Mary Jo Godziela, Sulzer Regional Library director, said every Harry Potter book is “eagerly awaited by children of all ages.” Yes, that means adults too, she said. Harry Potter fans are all guessing about the seventh book’s outcome, pondering such topics as: will Harry live, is Snape really with Voldemort and other mind-bending questions. “Hopefully no one dies, except Voldemort,” said Aidan Bachtell, 15, a fan since reading the first book some eight years ago. Lauren York, 12, standing in line at Sulzer with her mom and brother, said she hopes Harry doesn’t die and that he “catches” Snape, who she is convinced is a Death Eater.